Lockout stations ensure that padlocks, tags and hasps are readily available from a dedicated location. Manufactured from extra tough polycarbonate in a one-piece moulded construction - eliminating the risk of loose parts. Lockable translucent cover protects contents from dust and grime and ensures the LOTO equipment is there when you need it. Reinforced snap-on clips provide easy padlock and hasp storage and removal. All stations can be wall mounted (fixings not included). Electrical plug lockouts - small version (1mm dia x 1m) is suitable for UK standard 3-pin, 13 amp plugs. Large version (19139m) is suitable for 24and 55volt plugs. .. This miniature circuit breaker (MCB) lockout device is universal for many makes and models. It requires no tools to fit it on to the MCB. Locks out virtually all ISO/DIN circuit breakers throughout th..
For use by multiple workers who wish to isolate the same equipment with their own personal padlock. Steel hasp with 6 padlock holes on red handle. 6mm shackle diameter. These hasps are sometimes refer..
Thermoplastic padlocks with steel shackle (6.3mm dia and 38mm vertical clearance).Temperature resistant, chemical resistant, UV stable and corrosion resistant.Each padlock supplied with unique key for..
Tough, lightweight, dielectric thermoplastic bodies withstand chemicals and perform effectively in extreme temperatures (-47? C to 177? C]. Surrounds the valve operating handle to protect against acci.. 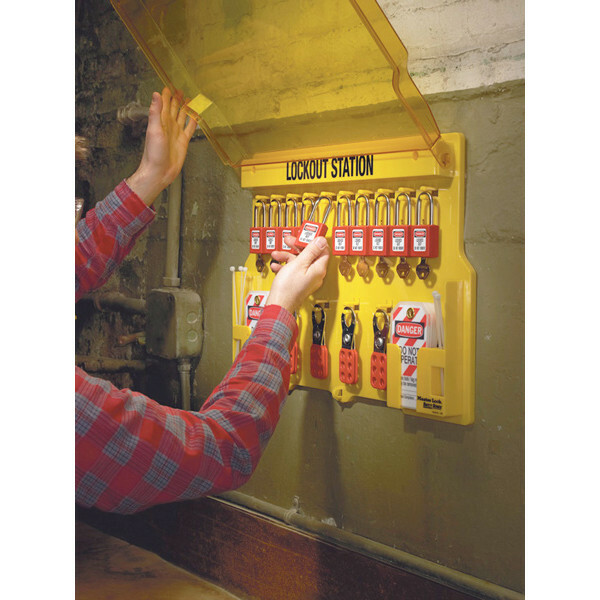 This toolbox safety lockout kit includes devices for locking off valves and electrical isolators. Contents included with the kit are:-6x Red Safety lockout padlocks (keyed different) - for additional .. Mild steel with red polyester powder coating. Includes key drop facility on lid. 12x padlock locators - accepts padlocks (not included) up to 8mm shackle diameter.HxWxD: 152x2395mmWeight: 1.85kg..
Lockout stations ensure that padlocks, tags and hasps are readily available from a dedicated location. Manufactured from extra tough polycarbonate in a one-piece moulded construction - eliminating th..